[Yoda mode on] Embrace the dark side, you will [Yoda mode off]. When you first ride the 2018 Indian Springfield Dark Horse, that’s exactly what will happen – it will make you believe it actually has a soul, and a dark one at that. 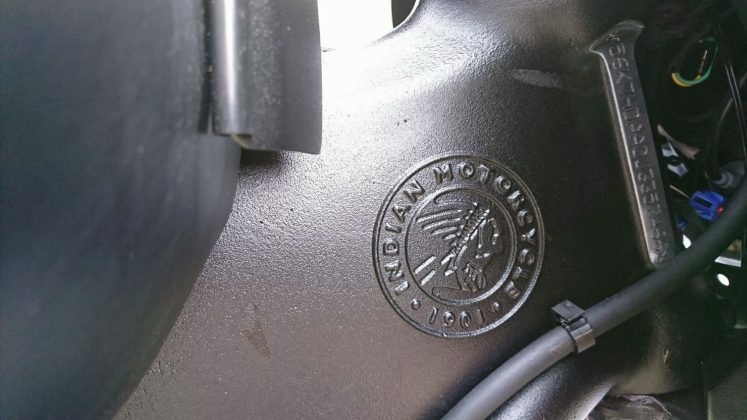 Sure, we’re having some fun with the claim made by Indian Motorcycle, but it could very well be true. This bike raises the bar yet again, and delivers in spades with retro styling and modern performance, in a fantastic package. 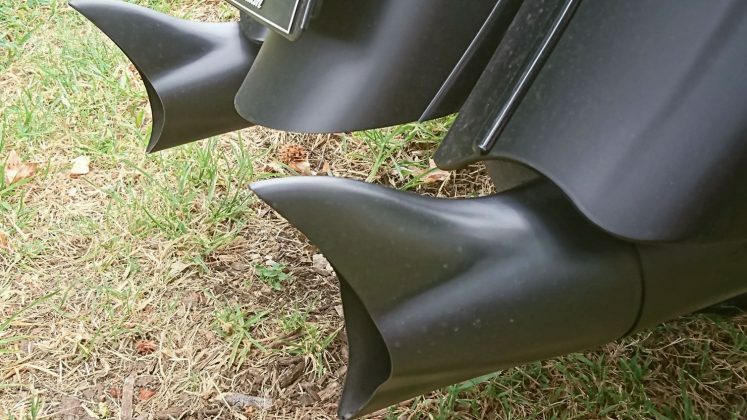 The 2018 Dark Horse version gets an update, with subtle yet dark cosmetic changes to give it a stealth look, including blacking out just about everything, including the exhaust pipes, which have retro bat style ends fitted. It carries the same posture and poise as the Springfield, a motorcycle that leaves no question of having a prominent place in the line-up of this historic brand that is synonymous for retro indulgence. It still carries the single headlamp and nacelle born in the 1960s, but what you now get is a dark themed matte finish, with matching black fog lamps flanking the headlamp. Surrounding the cluster is the tough and durable quick release windshield that has a clean envelope of air over the long haul. With this one can choose to go touring or to cruise in just a heartbeat. 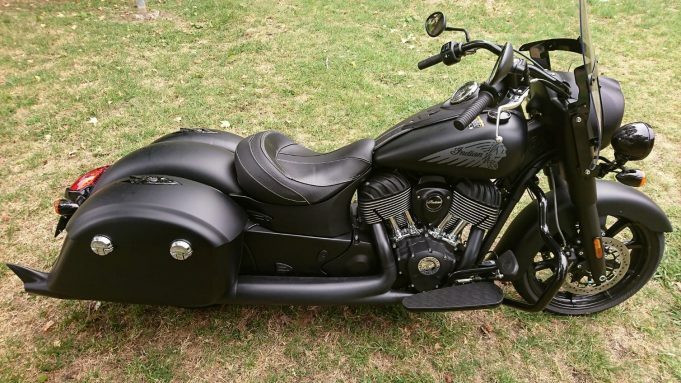 The stealth paint job includes the fuel tank, fenders, forks, rear view mirrors, handlebars and switches, turn signals, tank console, engine and air box cover, lower controls, front and rear highway bars and taillight housing. There are however a few chrome bits to keep the appeal of this bike – saddle bag locks and a couple of other small bits to compliment the stealth look. It holds true to its heritage with its design and makes it its purpose to let you ride in style. It offers a wealth of features and is one of the most badass V-twins on the market. The dash includes a main analogue digital unit along with a smaller analogue fuel meter which has many features. 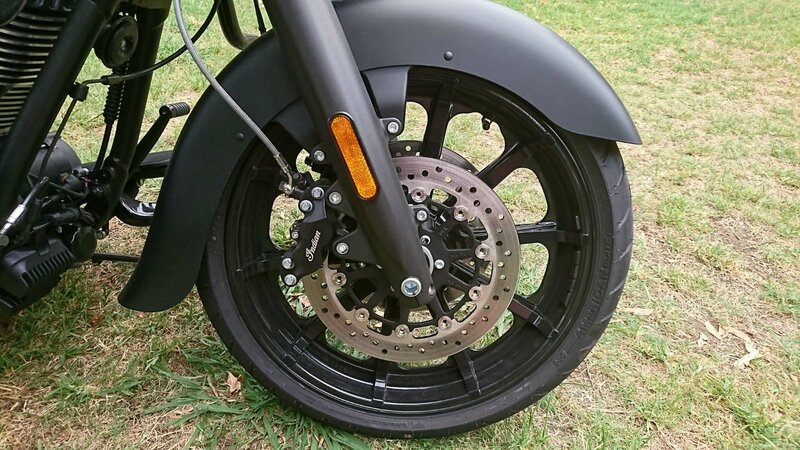 The saddlebags themselves will carry 10 kg each and can be unmounted with a quick-release lever. Talking of comfort, you can even lock and unlock the bags with a remote which also acts as a keyless ignition. An automatic trunk release for you and a start stop button. Fancy stuff. 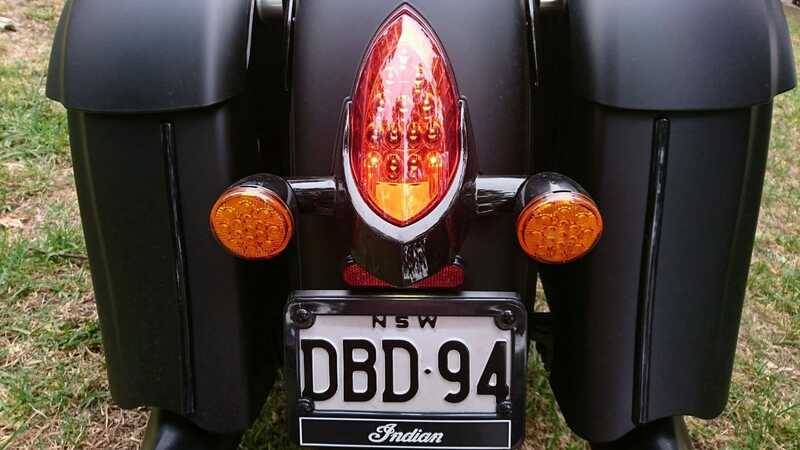 At the front, the fenders expose the 19-inch blacked out wheels which offer a nod to the Indian’s open fenders of the 20s and 30s era. 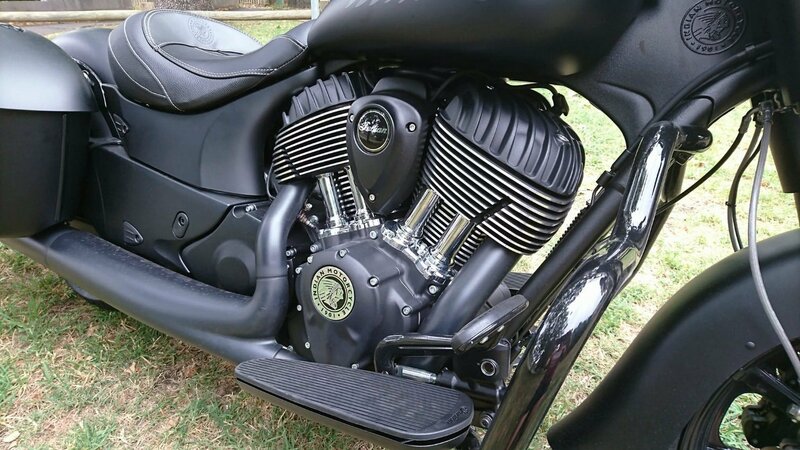 Indian has kept the old school charm for this engine layout with its valve train geometry, head construction and valve-cover design, while the new tech fuel injection fitted offers excellent fuel consumption. The Thunder Stroke 111 engine used in the Chieftain is here too, with its 1811cc V-Twin, capable of belting out 150Nm of torque. That’s enough torque to tear apart the tarmac and accelerate without breaking a sweat in every situation. It is both oil and air cooled and operates pretty smoothly compared to some of the heavy throbbers around. The engine breathes through a 54mm throttle body and transmits power to a 6-speed gearbox through a cable-actuated clutch with a relatively light pull. Power, like in all Indians, is always on tap and is delivered to the rear wheel via a belt-driven system. The transmission is set on the right-hand side of right cam cover and multi-directional finned valve covers. You can even notice the downward firing exhaust outlets that makes the Dark Horse roar. Renowned for cruising comforts, the Springfield gets a well-supported solo saddle which will give you enough cushioning to ride on forever and not break your back. Handlebar position is quite upright, and the floorboard will provide you with enough room to rest your feet the way you like to. The low slung stance will see you scraping the underbelly every time though, and that’s a bit of a disappointment. As a result, the Dark Horse falls into easy turns, but hairpins and u turns can be quite tricky for those not used to the bike’s size or weight, at 376kg. The steering geometry is engineered in such a way to deliver responsive handling in any situation though. The cast aluminium frame is lightweight, yet exceptionally strong, and provides the rider excellent low-speed handling while stopping power is provided via dual four-pot callipers on a 300mm brake disc (front), and a twin-pot callipers on a 300mm disc (rear). ABS comes standard, and knowing you can brake under control in any situation is comforting, while the additional footbrake that grabs both front and rear gives further confidence. This beast of a bike rides on a 19-inch cast wheel (130/60B19 61H) at the front and 16-inch (180/60R16 80H) at the rear, ensuring you will glide your way down the road. Cruise control comes as a standard feature too. This 2018 Indian Springfield Dark Horse hits the road at $34,995 ride away, the exact same price as a standard Springfield. While testing the Dark Horse we also had the chance to sample a 2017 Indian Chief Dark Horse, fitted with some nice add-ons. These included a high flow air cleaner, and Stage 1 camshaft and exhaust. If you want to add the crisp snap crackle and pop to your exhaust and extra noise to your throttle, we can highly recommend them for your 2018 Springfield Dark Horse. Our 2018 Indian Springfield Dark Horse was supplied by Indian Motorcycle Australia. To find out more, contact your local Indian Motorcycle dealer.